I haven’t had too much luck with recent Glen Garioch. Then again, I’ve not had very much of what’s been officially released. I didn’t like either the NAS Founder’s Reserve or the 12 yo enough to want to try their other vintage releases. This is a single cask selected by Binny’s though and a Binny’s pick is usually a safe pick. Well, that didn’t prove to be true for me with Monday’s Clynelish. Let’s see how this one goes. 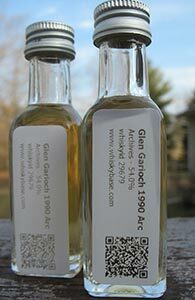 I have previously reviewed two Glen Gariochs from 1990. I quite liked this 21 yo from Archives, but was less enamored of this 20 yo, which was from the Dutch bottler, Kintra Whisky, as is the one I am reviewing today. Those were both from bourbon casks, whereas this one is from refill sherry and a hogshead at that. 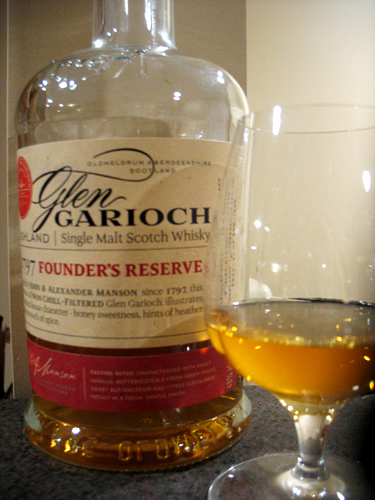 Indeed, it may be the only sherry cask among the few Glen Gariochs I’ve tried. Let’s get right to it. Following my recent review of a 20 yo from 1990 bottled by Kintra Whisky here is a 21 yo from Whiskybase’s Archives label, also from 1990. It was tasted, and these notes taken, right after the Kintra. It will not surprise you to learn that I found these to be similar in many ways. I also found them to be quite different from the current official releases that I’ve reviewed. Of course, that may simply be a function of these being single casks and being much older. They do make me want to seek out more Glen Garioch from the 1980s and earlier. Anyway, let’s get to the notes. 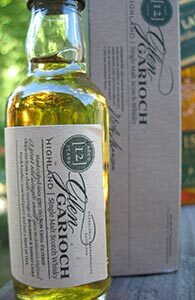 The recent official Glen Gariochs I have reviewed so far have not greatly enthused me. Let’s see what the story is with some older, recently released independents. 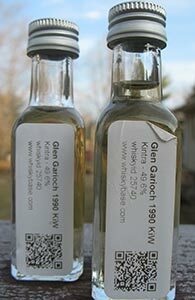 First up, is a review of a 20 yo from 1990 from the new’ish Dutch bottler, Kintra Whisky. This will be followed soon by a review of a 21 yo from 1990 from another Dutch label, Archives (the imprint of the guys at Whiskybase). Though the reviews are being published a few days apart the whiskies were tasted together. As I’ve never purchased a mini and do not accept samples (not that anyone has yet offered) I am not entirely sure where this mini of the Glen Garioch 12 came from. I suspect that it was included in an old order from the Whisky Exchange as part of some Morrison-Bowmore promotion but I’m not certain. At any rate, I feel comfortable posting reviews of freebies received well before I had even thought about having a blog (this may or may not be a contravention of my protocols). I do know I’ve had it for quite some time. I’ve never felt particularly motivated to taste it as a full bottle generally goes in the range of $50 in the US, and that’s usually above what I’m willing to pay for a 12 yo non-cask strength malt. But a local store currently has it on sale for a little below $40 so it seems like a good time to see if it’s any good (this review is being written in mid-September). 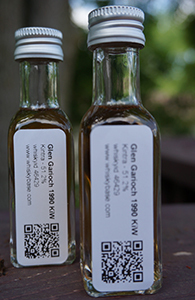 Glen Garioch’s line of whiskies was revamped a couple of years ago, with new packaging, no chill-filtration, and higher strengths (not to mention, higher prices) the key changes. Oh, and some reductions in the ages of the core whiskies too. In place of the old 15 yo there is now a far more expensive 12 year old (a review follows tomorrow), and the NAS (and $20 more expensive) Founder’s Reserve replaced this old 8 yo (which used to be a staple in the Duty Free in New Delhi’s international airport in the early-mid 2000s, easily recognized by the stag on the label). I’ve never actually tried it before, however; no time like a few years after something went extinct to finally make its acquaintance. I have tried very little whisky from Glen Garioch (pronounced “Glen Geery”) which is currently owned by Suntory, who also own Bowmore and Auchentoshan. 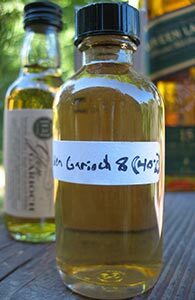 Far more experienced drinkers and reviewers swear by the quality and reputation of Glen Gariochs of an older period (from the mid-80s and before and apparently peated) but nobody seems to get too excited about anything produced in recent decades. The official distillery bottlings used to be a 8 yo and a 15 yo (with a stag on the label and a staple of airport duty-frees) but the lineup was revamped a few years ago. Unfortunately, but predictably, at one level this took the form of fancier bottles with younger whisky in them at higher prices. On the plus side of the ledger the abv was also raised, to 48%, and chill-filtering was dispensed with.